The sixth meeting of the network of European health ministry focal persons for violence and injury prevention took place in Oslo, Norway on 11–12 October, attended by 70 participants from 37 countries in the WHO European Region. 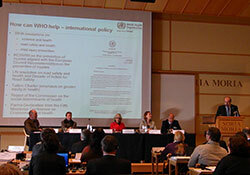 The plenary sessions focused on services for victims of violence, delivered by staff from the Norwegian Centre for Violence and Traumatic Stress Studies, and a WHO expert highlighted the global directions for the violence prevention networks, including the forthcoming survey for the global status report on violence prevention. The network was praised for its strong achievements and the collective work ahead was outlined. The participants networked, exchanged experiences in their countries and debated joint actions ahead and the lessons learnt from the Decade of Action for Road Safety 2011–2020 and the survey for the second global status report on road safety. They found the meeting stimulating and agreed to support forthcoming work to build capacity, develop policy and make a European report, planned for 2012, on preventing child maltreatment and other adverse childhood experiences.